In the topic points of view we look at China. Stirring Trouble Internationally creates its own Marxism Conference by asking questions about Marxism. Stirring Trouble Internationally paints the analogy and explores deeper the drumming of Maoism and the handling of how war goes on. In addition to this to explain further we look at how the armies and special forces are managed in relation to today’s Marxism combination with: Maoism, the teachings of Carl Marx‘s theories and , the more traditional theories like Maoism and other reasons which might help countries. Either help China or for other countries to follow in its footsteps, if indeed there are any left. So is Marxism and Maoism teachings dying out in China? 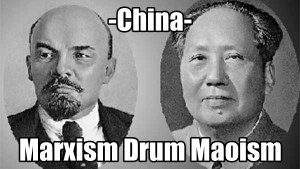 Marxism is dead in China but the Party leaders base their legitimacy on his teachings. So they have to convince citizens to like it again. Tough call.